Margin: 1/2 length to VIC, 1 3/4 lengths to NSW, 2 lengths to SA. NSW were the early leaders over Victoria. However by the mile mark Victoria were in the lead to NSW then Queensland. The race then tightened with Queensland and SA then drawing level with NSW with Victoria a mere canvas in front. VIC finished 2nd but were disqualified for passing outside a buoy at the mile mark. Queensland then overtook NSW before overhauling Victoria with only 150 yards to go. NSW finished 1 3/4 lengths behind Queensland. A crowd estimated to be 12,000 people witnessed the great victory of Queensland. The sculling championship was the fourth win in succession to Cecil Pearce in another commanding performance in a record time for the course. 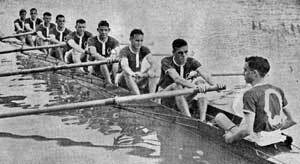 Jack Pritchard in his book Rowing in Queensland advises that this time was still unbroken for that distance as at 1995. Tasmania led early but were passed by Victoria in the second half of the race. The conditions were rough and crews took on water. Nell Walsh of the Victorian crew was a grandmother who decried the onset of middle age and the effects of child birth to become a very able oarswomen. 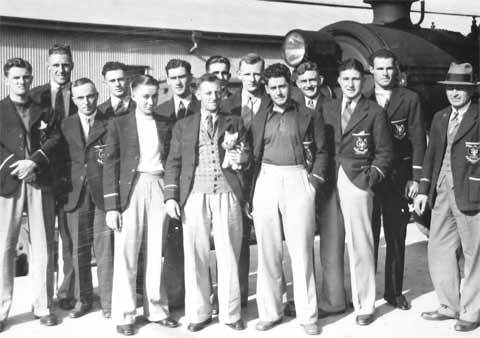 She also stroked the 1941 winning Victorian crew. The bow of the same crew under her married name Jess Gaynor, coached the Victorian crew in 1957.